Feed Your Fiction Addiction: Maybe Someday - One of the Best Author Events Ever! 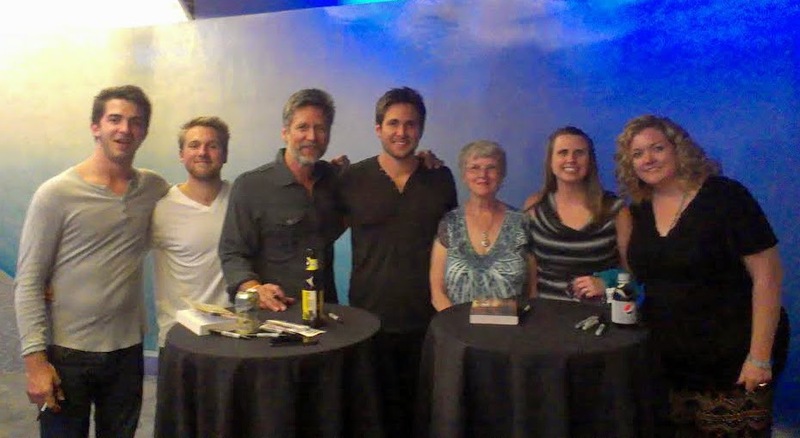 Maybe Someday - One of the Best Author Events Ever! Don't know about Maybe Someday? Check out my review of this awesome book HERE! So, what made this signing so much fun? Well, for one thing, the concert! If you've read the book, then you know that the songs are a MAJOR component. Hearing Griffin Peterson and the band play these songs in person was just, well - amazing! The only thing that would have made it even better is if people had sung along a bit more (I've never been to a concert before where everyone sat through the entire thing and it didn't seem like that many people were singing along - come on, get into it, people!). 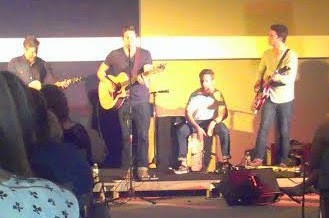 Not the best quality pictures, I know. One other thing that made the night extra special was the fact that Griffin was playing with his dad, who jumped in with just five days notice. Because of this (I assume it was mostly because of this), Griffin had TONS of friends and family there - aunts, uncles, cousins - apparently there were 85 people there just to cheer Griffin and his dad on. And it made the whole event feel more festive! From random audience members shouting out. "Go, Papa Peterson!" (which apparently, family members actually do call him Papa Pete sometimes) to little girls raising their hands during the Q&A and asking, "Who's your favorite cousin?" it was all just so much fun!! Speaking of the Q&A - again, it was just somehow a cut above other Q&A's I've been to because both Griffin and Colleen are so darn personable! They're both really down-to-earth and their interactions with each other were often hysterical. For instance, hearing them tell about how they "met" online after Griffin was on American Idol and everyone was commenting that he looked like Dean Holder was so much fun - they just had this easy banter between the two of them that made you realize that these are two people who genuinely love life and enjoy working together. One lucky person won signed copies of ALL of Colleen's books - including Ugly Love!! Can I just tell you how jealous I was? I NEED an ARC of Ugly Love!!! (Come on, Colleen, help a girl out!) But then I saw the winner's very obvious monarch butterfly tattoo (she confirmed it was straight off the cover of Point of Retreat) and found out she drove in from St. Louis for the event and decided she deserved to win - anyone with permanent Colleen Hoover body art is a true fan!! I just can't top that. Of course, the signing line was long, which was to be expected. Colleen was super gracious and let people bring in as many books as they wanted to have signed. Since I own Kindle copies of most of them (except Maybe Someday, which I have a paperback of), my mom and I bought a copy of Slammed and a t-shirt to support the signing event (and so that I'd have another book to get signed - and an awesome t-shirt to wear). 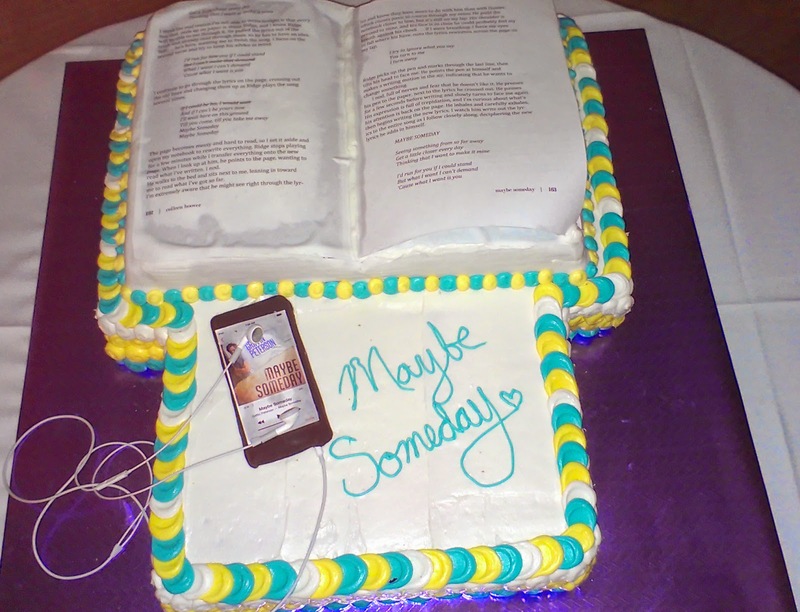 A fan made this awesome cake - complete with turnable pages and a working iPod! So, that was the event. If you have the chance to get to one of these, I highly recommend you go! !